I found a dead guillemot on Flanders yesterday. Odd really as it is a ocean going cliff nester. So why was it there on the moss dead? It was one of thousands that in the last few weeks have been blown inland by very strong and cold east winds. Many birds have been found inland, on rivers, lakes and ponds, trying to escape the harsh weather. And many haven’t made it back to the sea because they were already in a weakened condition. So does it really matter? Well it does to me, as I used to work on the Isle of May where thousands of these birds breed, so I know guillemots and I may even have known this bird personally. But it matters to the rest of us as well. Because this dead guillemot tells us a tale. Guillemots and other seabirds have always died like this on occasions but recently these occasions have been getting more frequent. Climate change is causing big weather events more often. Couple this with birds that are weakened by fewer fish in the sea and poisoned by plastic pollutants and it means the rate of seabirds dying is higher than the rate of birds raising chicks. So the population is going down. 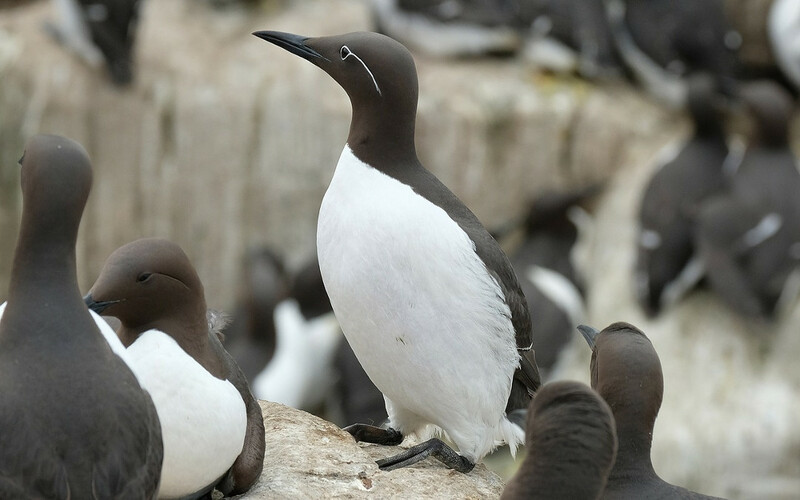 You might not worry too much if there were fewer guillemots or other seabirds but you should worry that this is a symptom of oceans degrading through pollutions and the planets climate changing and this is being caused by us. All of us. And lots more ways on the Greener Scotland website here. The thing is, climate change and plastic pollution didn’t kill this guillemot – but it did contribute to its death just as we are all contributing to climate change. So finding this guillemot leaves me sad, angry and frustrated and determined to do more. What about you? This blog post was originally posted by Scottish Natural Heritage on 28/03/18.